Rolex 6694 good choice for vintage? Hi.. newbie here.. asking rolex 6694 good vintage pieces? Or any others pieces can advise? 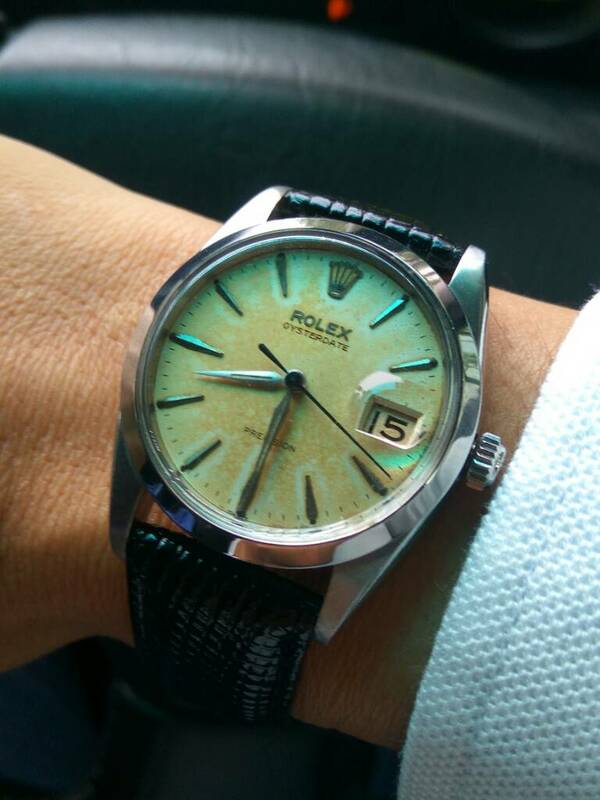 Re: Rolex 6694 good choice for vintage? Hahaha bro! It depends on what you want from the watch? It got plexiglass, handwind Rolex movement which is very shock resistant, 50hrs power reserve. Wanting a beater or an entrée Rolex to test the water? Just purely enjoying the sturdy Rolex handwind movement? it is a classy entry level rolex, provided you dont mind hand wind everyday + really turn the hour hand 2 rounds to change date . Yes, the date changing is tiresome. I'm just too lazy to change it. I'm loving it. It's a great first Rolex.cheap to maintain and loads of spares. They come in an assortment of colors so u can certainly find one which fits your taste. Not a bad vintage piece. A lot of people selling online.. just make sure you're not getting a fake and that also take into consideration the service costs etc. etc. any recommended vintage watch with automatic winding? 6294 or 6694 is better? As it is mentioned, this is a Rolex vintage watch... I have it since 1974, although not fully wearing it nowadays for quite sometime. Although it is manual, it is running quite accurately daily. 6694 is good entry vintage model, caliber is reliable and service is affordable as well. Go for gold tone hours marker blue, silver, and black dial first, if you're into 6694. Great watch and wears a bit smaller than modern Rollies out there. Make sure you're hardworking if you wear it because it can be a bit tiring to wind the dates sometimes. Save up and buy the latest brand new Oyster Perpetual. The last time I asked it was priced about 18k. It comes in a few diameters and is automatic. There are a few colour dials to choose from. I wouldn't bother with the 6694 at today's asking price. More than 10 years ago I sold mine (bought pre-owned) in pristine condition @ 3k. I got fed up with the manual wind movement and non-quickset date. I would suggest some 1500. Automatic and affordable and still 34mm. yes, it is a classic, very elegant dial when worn with a jubilee or leather strap. My dad has one and I love it! Any idea which type of bracelet is more popular? Understand that there are thin and thicker bracelet. The thicker bracelet is the latest current one. The thin one for 6694 is no longer available for sale, according to RSC here, only the thick one. According to my Dealer, thin bracelet is more collectible as compare to the thick version. There are plenty 6694 in the market, he advise me to go for the thin bracelet. Any logic on this?